The first Jason movie I got to see theatrically, sadly, was Jason Goes To Hell, but thanks to theaters like the New Beverly, I've been able to see all but one of the Paramount entries on the big screen and in 35mm. So it's kind of cool that I'll get to see the last of the bunch at my own screening! 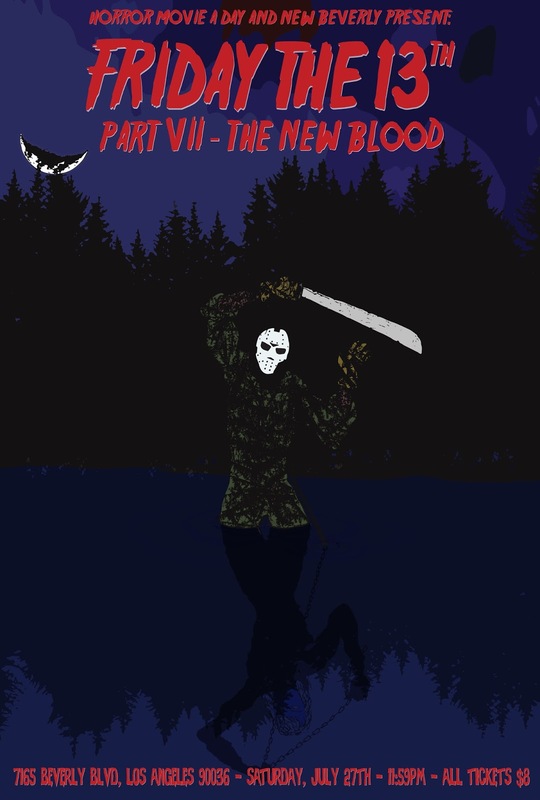 On Saturday, July 27th, at 11:59pm, I will be hosting a 35mm showing of Friday the 13th Part VII: The New Blood, to celebrate not only my quest to see all of Jason's adventures on the big screen, but also the film's 25th (!) anniversary. Now, longtime readers of the site probably know that I don't think too much of this one beyond Jason's design (my favorite of the "zombie" era Jason looks) and a few of the kills (my affection for the weedwhacker kill turned out to be a fortuitous one - as it turns out they used New Blood for all the clips on the Chiller special, so it made it easy for them to cut me into the segment! ), but nearly every single time someone defends it as one of their favorites, they mention that they saw it theatrically with a big crowd and it was a huge part of the experience. I, on the other hand, have only ever seen it at home, by myself, so maybe I'm just missing that special ingredient. I doubt I'll ever find it better than my favorites (4, 6, and 2), but maybe it can at least top the New Line entries in my eyes? Join me as I find out! As always, the screening will be at the New Beverly Cinema at 7165 Beverly Blvd in Los Angeles, two blocks west of La Brea. Street parking is widely available (Formosa is your best bet) and the movie is a mere 8 bucks at the door (yes, they take cards now), or you can order in advance at BrownPaperTickets. The screening is at 11:59 pm on Saturday the 27th, and there will be a brief intro by yours truly as well as a few giveaways. Unfortunately the big guy himself, Kane Hodder, will be out of town that weekend at one of the horror conventions (in Louisville), but I'm still trying to track down one of his victims to come offer up their memories for a Q&A - cross your fingers! Feel free to repost on your own blogs or sites, and that extends to using the awesome custom poster by Jacopo Tenani! I want a packed house so I can finally see this one the right way!